The old, old church is a hearty eighty-six steps up a steep hill from the village. Even with our daily five miles, I started to feel winded. This is no gentle slope. 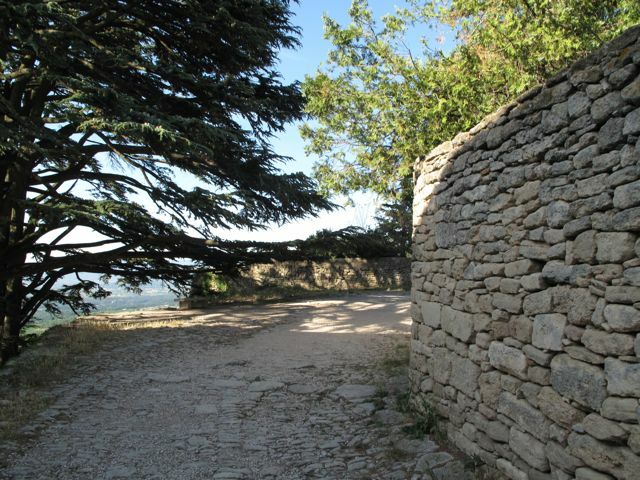 Did there used to be more dwellings that high up in Bonnieux or was that all part of it? In the 12th century was this just what you did every Sunday? Or several times a week for that matter? 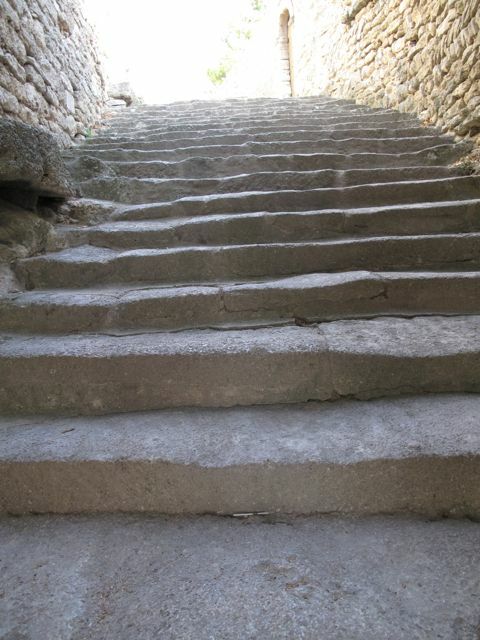 And just as Gothic cathedrals’ heights help bring their congregations closer to heaven with their arches and steeples, are these steps supposed to signify a journey towards communion with God? Of course in my state of rapture, in reaching the top, in Provençal July heat, and in Christian ruins, I didn’t bother to take any pictures of the church itself. There’s hardly enough room at the top of the hill to get far enough away from the wall of the church to capture it all in one shot anyway, and the church itself was locked (though it isn’t used as a church, classical music performances are held there occasionally). There’s a little bench up there at the top under that big cypress tree that’s obscured by the tree’s shadows. It’s so quiet up there, and windy too. In a way it’s soothing to sit on that bench, and in a way it’s very eerie, being so high up, and so dwarfed by everything around you–the church, the trees, the vista, and time itself. 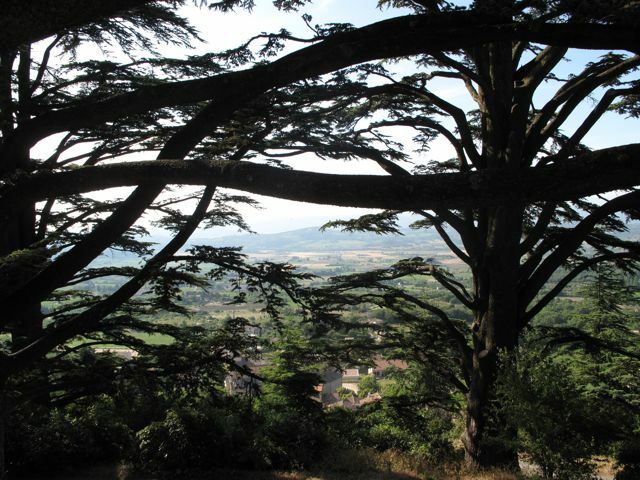 Sitting in the shade and peering through the big dark cypress branches makes you understand Cezanne and the awe he obviously felt a bit better (think Forest 1894 and Landscape Near Aix, the Plain of the Arc River). I have such a different perspective on Cezanne than I used to. In college I fought one of my art history professors constantly about him–I just never felt the still lives and thought he was over-credited for his perspective. 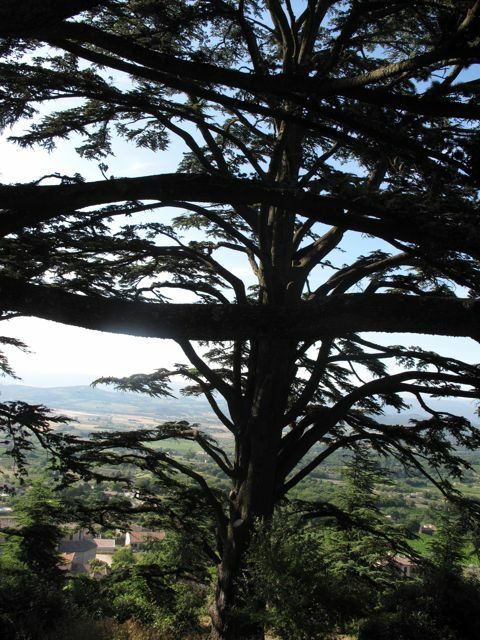 Now looking at his landscapes that once seemed so benign to me, I see much more of the turbulence that I feel is the essence of Provence–it isn’t that calm lavender scented-rosé filled country the Brits, or whoever else might think it is–it’s thick and heavy. Life is really felt here. As the French say, it’s sauvage–wild. Tonight the Jews will celebrate the ancient exodus from Egypt and slavery. Unfortunately I will not be formally celebrating tonight, but My Kugelhopf quickly transported me to possibly the most pleasurable part of the seder meal (and any meal): dessert! Kerrin Rousset of Kugelhopf has posted the most mouth-watering delectable matzoh-sweet explosion. In the vein of many of my chocolate posts of late (here and here; reviewing chocolates such as Fran’s, Poco Dolce, and Barlovento), Rousset mixes her matzoh with “golden butter caramel and creamy dark chocolate” + Maldon salt? My favorite??!! OY VE!!! This post is a MUST read and the recipe–a MUST try. It’s EASY. I’m running out for some last minute matzoh right now! I was spotted by the resident while snapping pictures. Apparently, there is a trip line just in front of where I was standing, put there to catch dogwood poachers(!) Apparently several have been caught. In spite of the apprehension of perpetrators the woman said that she had almost stopped being able to enjoy the tree over the years because of the constant poaching. Isn’t that awful? On the other hand I don’t know why I was so surprised. I’ll never forget my first month in Rockridge with all my roses flourishing only to go outside one day to find them all chopped off the top of the bush. So sad. My mother reminded me of the legend of dogwood, which is particularly appropriate for the coming week. According to legend, the cross of the Crucifixion was made of dogwood. Ever after, dogwood trees had blossoms in the shape of a cross, two long petals and two short. The outer edge of the petals are indented and brown due to nail prints and rust, and the center is made to represent a crown of thorns. On this day I didn’t do exactly what my soon-to-be President told me to do, I didn’t paint any houses, or make meals for the poor; but I did spend some time rereading the words of the Reverend Doctor Martin Luther King Jr. and consider what he might think of 2009 if he could come visit us here now. I studied in particular “A Realistic Look at the Question of Progress in the Area of Race Relations,” an address Delivered at St. Louis Freedom Rally (10 April 1957 St. Louis, Mo.). The full text is available here. In many ways the Reverend Doctor’s address could be delivered today. To paraphrase his message I say: should we spend this day in depression that it is the children of people of color in this country who are systematically denied equitable educational opportunities, still, in 2009? No. Should we all rejoice in the election and inauguration of America’s first African American president? Yes. Should we let either of these emotional poles (depression, rejoicing) lead us to stagnation and fits of inaction? Absolutely not. Yet, let us use this day to become activated to refuse to accept things as they are. Let us remind ourselves that just as the Reverend Doctor was appalled by the disparity of salary between blacks and whites in “A Realistic Look” so to should we be appalled with our census bureau data from 2008, which reveals that while the “median usual weekly earnings of [White] full-time wage and salary workers” was $739, the “median usual weekly earnings of [Black or African American] full-time wage and salary workers” was $589. See source here. In King’s time he admonished the audience to support the NAACP and told them that the fight for freedom and equality comes at a cost–one with a dollar sign attached. So, today, why not give money to the NAACP? 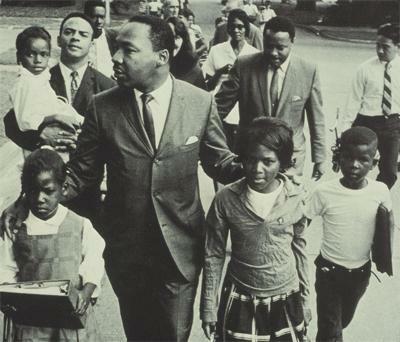 King summoned the crowd to Washington to march to persuade the government to enforce civil rights laws. So, this year, why not organize a march? As King said, to do so is not to fight for African Americans alone, it is to fight for this nation. Tall leaders (Yes), sun-crowned, who live above the fog in public duty and in private thinking. As I sit in the wilderness poised between my depression and rejoicing I know one thing: we have a leader. We awoke this morning to snow falling dreamily from the sky onto our wooden surroundings. Christ the Lord is Born Today. I was so relieved that my family finally decided to do Secret Santa this year. I’m not a fan of Christmas shopping, and although I was blessed with a lot of toys and fabulous gifts as a child, I come from a religious Christian family where the focus actually was more on the Advent Wreath than counting down the shopping days. For the third year in a row I’ve considered banning myself from buying ANY Christmas presents, sort of in an anti-materialist protest. But there’s a catch: I have a large family of in-laws who get me tons of gifts. I haven’t figured out how to navigate this yet, all I know is that not getting them anything makes me feel like a giant schmuck. Ergo, last minute Christmas shopping. Oy ve. Determined not to be oppressed by big box stores and the like, I’m grabbing some reusable bags and heading up to College Avenue (I know, I sound so effing Oaklandish right now). I’ll be finding little trinkets from my local businesses and business owners. We Rockridgers just can’t get enough of mom and pop and small business. Call us crazy. If you’re interested in following suit, I recommend checking this website if you are unfamiliar with the area. I’ll be checking out: Market Hall and Pasta Shop, Maison D’etre, Bloomies Flowers, Bella Vita, Pendragon Books, Rockridge Home, The Alta Bates Showcase Thrift Shop, Diesel Books, Atomic Garden, Pretty Penny, Body Time, Crossroads Vintage, and Recapture. Find more info on these shops here. I might also cruise Telegraph (the “Temescal” district) for Scout Home Hardware and Sagrada Sacred Arts. Diesel Books really soothes me.